The separation of church and state is an outmoded political framework that dangerously ignores the most pressing question of our time, former British Prime Minister Tony Blair told a large McGill audience on Nov. 12. Blair was on hand to officially mark McGill’s participation in the Tony Blair Faith Foundation’s Faith and Globalization initiative, which sees education as a way to promote a greater understanding between people of all faiths worldwide. After brief opening remarks by Principal Heather Munroe-Blum, Dean of Religious Studies Ellen Aitken, the Foundation’s chief executive Ruth Turner and philanthropist and McGill alumni, Jonathan Birks, Blair sat down to discuss questions from moderator and McGill Religious Studies graduate Evan Solomon, who host’s the CBC News program, Power & Politics. Blair, who was Prime Minister from 1997-2007, told the audience that, after stepping down, he set himself three goals: to become a Middle East envoy, to tackle global warming and to bring world religions together. A smiling Blair suggested that those three modest choices were proof that he was suffering from “Napoleonic delusions,” eliciting a roar of laughter. On the latter of his three post-retirement goals, Blair, through his Foundation, has partnered with seven universities around the world: McGill, Yale, National University of Singapore, Durham University in England, Tecnológico de Monterrey, the University of Western Australia and Peking University. While many politicians are too easily swayed by polls to debate issues of religion and reasonable accommodation with sincerity, academics are above “the swirl of public opinion,” Blair said, making them essential in “establishing an intellectual framework” for honest discussion. And while he trumpeted diversity as one of society’s great strengths, especially in an increasingly globalized world, Blair – who admitted he was pro-immigration and pro-integration – stressed the importance of establishing a “common space” where people from different backgrounds could interact in an atmosphere of respect. Blair also met a class of students in the Religious Studies course established as part of the Faith and Globalization Initiative, as well as joining Munroe-Blum in meeting Quebec Premier Jean Charest. 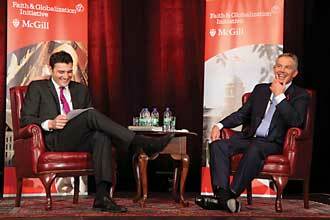 He also lunched with senior McGill academics and attended a reception following the main event.